Mesosphere: the layer of the Earth's atmosphere that is directly above the stratosphere and directly below the mesopause. It extends from about 50 to 85 km (31 to 53 miles) above our planet. In the mesosphere, temperature decreases as the altitude increases. The coldest temperatures in Earth's atmosphere, about -90° C (-130° F), are found near the top of this layer. The boundary between the mesosphere and the thermosphere above it is called the mesopause. 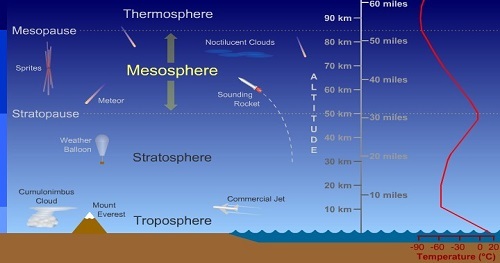 At the bottom of the mesosphere is the stratopause, the boundary between the mesosphere and the stratosphere below. Since it is difficult to take measurements of the mesosphere directly using instruments, much about the mesosphere is still mysterious. There are currently no items matching "Mesosphere".